Aerospace engineers may have to write what is effectively a whole new resume for each job. The name of the game in this field is “generalist or specialist” If you’re a specialist, your skills sets may involve a lot of different information areas and requirements. If you’re a generalist, your skill sets may have to cover a lot of different operational requirements. The easy way to manage information in either case is to use the job criteria as your checklist. When writing your aerospace engineer resume, systematically go through the job criteria and make sure you’re ticking all the boxes. Be patient, but be thorough. You get one shot at getting a resume right, so do it properly, like you would your job. Skills section – This section can be a space management issue, and needs careful management. Qualifications – Another very important section, and also directly related to the employer’s checklist requirements. Keep this simple, a basic career goal statement. Be meticulous with this section. You need to focus on the required skills, but you also need to present your skills well. You may want to refer to specific avionics systems (you may have to, too) to show superior skills and experience, for example. This is another area which is all about documenting your skills, so make sure that you spell out your full spectrum of credentials. Stick to the employer’s criteria, but use any opportunity to improve your presentation or show strong skill sets and values. 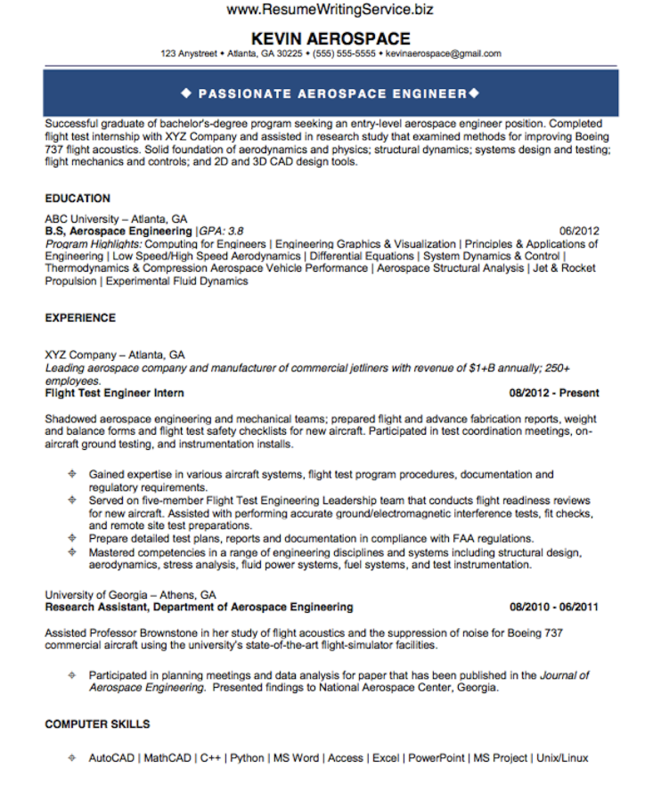 When you’re writing aerospace or aeronautics engineering resume, you’re competing with top of the line professionals. Your resume must look good, be competitive, and present well. The truth is that presentation is a major factor in success of a job application. Your resume needs to look like a competitive resume, as well as being competitive. Take the time to consider layout and formatting. Also consider formatting as a way of managing space issues on your resume. You can add space by using sidebars, standout text boxes, etc. This improves your space options, looks good, and helps you deliver more information very effectively. The Bureau of Labor Statistics has lots of useful information for aerospace engineers regarding salary, job market projections and more. Use the BLS website to explore the prospects in your profession. To find more useful information on resume writing for other professional fields, look for information technology resumes on our website.